Hmart, the Lyndhurst, NJ-based Korean grocery store chain, has been on the move recently, opening new locations in San Jose, CA; Chicago, IL; and Austin, TX, as well as closer to home base in Paramus, NJ. 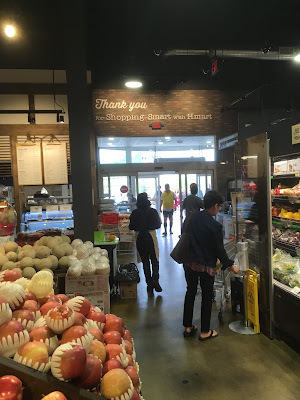 The Paramus location is smaller than the average Hmart at 25,000 square feet and competes with ShopRite, Whole Foods, Fairway, and Stop & Shop in Paramus -- although none of them really overlaps with Hmart's business model. 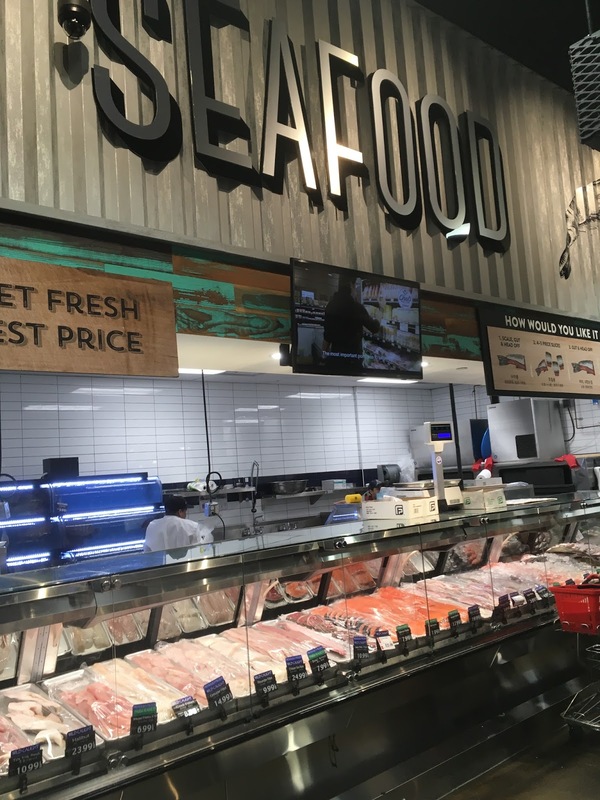 This store, located in Hmart president Stacey Kwon's hometown, aims for an upscale yet authentic feel, and pretty successfully accomplishes it. Pretty modest Grand Opening signage. 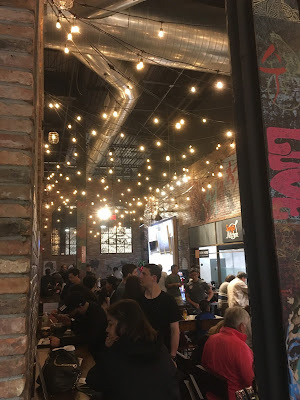 I visited on May 6th, 2018, and the store opened on April 27th, 2018. 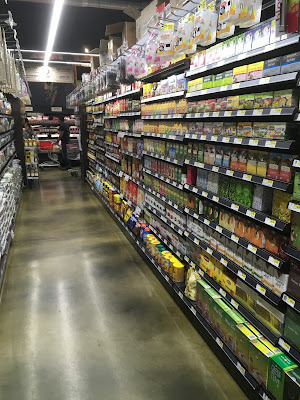 Hmart does things differently from most other supermarkets. Even their carts look different! Hmart definitely has a larger selection of the "more," as the storefront puts it, than most other supermarkets. You enter under the curved facade section to the vast produce department. The Market Eatery food hall (as they call it) is to the right after that, with meat lining the back wall, seafood in the far back corner, and a bakery/coffee shop on the far side of the front end. Let's head in! This is the view immediately inside the entrance. Pretty impressive! The entrance is just on the other side of this stand, which I believe is sushi. Checkouts are straight ahead, with produce to the right. The design of the space is spectacular. Nothing was overlooked. The Market Eatery is on the other side of this arched brick wall. The section was pretty crowded, so I couldn't get many pictures. However, I do hope to return sometime...and eat! The lighting is amazing in this section. Striking in person. Looking back up to the entrance/exit. By the way, the selection of organic produce was better than in almost any other supermarket I've been in recently. The prices were rather high, but that's to be expected. Quality is top-notch, though, and the selection is hard to beat. There were lots of managers (both on the store level and the corporate level) around, but none of them seemed too concerned about my photography! The meat department covers most of the back wall and extends into the corner behind the Market Eatery. 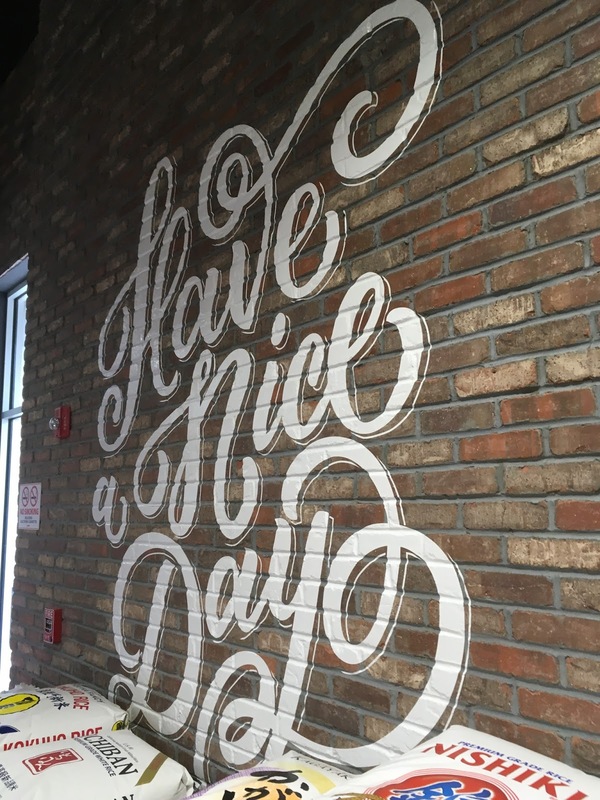 The food hall is on the other side of the brick wall to the right. 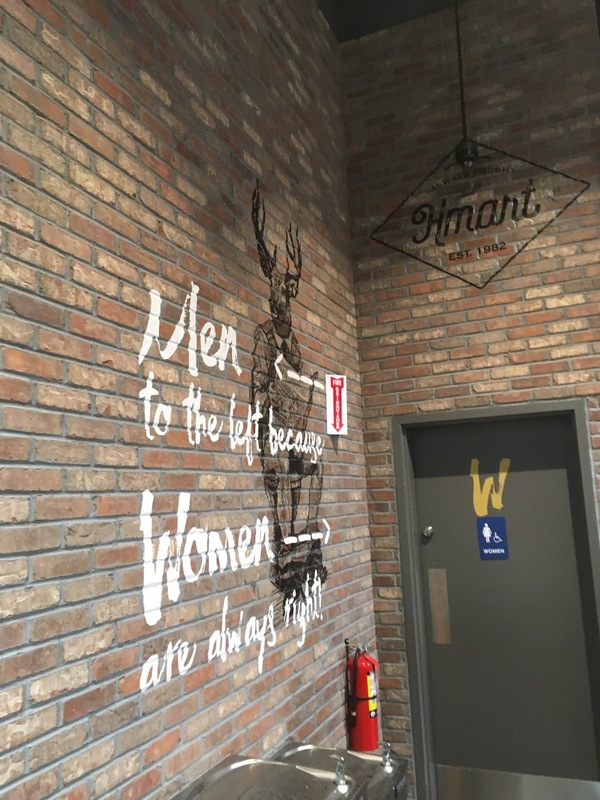 I believe Hmart does its design in-house. Whoever does it does a great job! Large marinated meat bar. Because that's what every supermarket has. Wow. Don't even think about getting the recipe for that marinade. There is a dairy section at the back of the produce aisle, although I don't remember if all the dairy is there. Meats continue along the back wall. And although Hmart is primarily a Korean store, there are plenty of regular American groceries as well. This store, unlike some other Hmarts, does not have a service deli. Beautifully displayed, top-quality, really expensive. As, I'm sure, renovations to this building must have been! Heading down a grocery aisle, we find again a nice mixture of American and Korean goods. The aisles are a little narrow for my taste, but the selection makes up for it. Refrigerated Asian groceries in one of the aisles towards the end -- which I know nothing about (although I should). 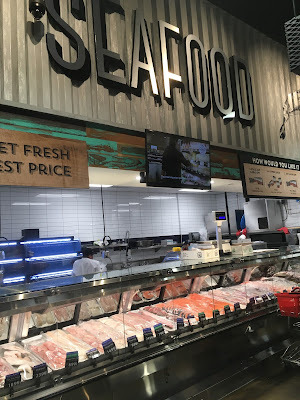 The seafood department is in the back corner opposite the entrance, and is impressive as well. In addition to the standard counter to the left, there is an island with shrimp and other similar seafood, which you can see on the right. Live fish are also available. And on top of all that, the whole area was spotless, as Hmart's stores typically are. Once again -- not cheap, but very fresh and high quality. If you zoom in, you can see some of their seafood has the specific source, including Maine and Prince Edward Island . It's all marked wild-caught or farm-raised, and color-coded. 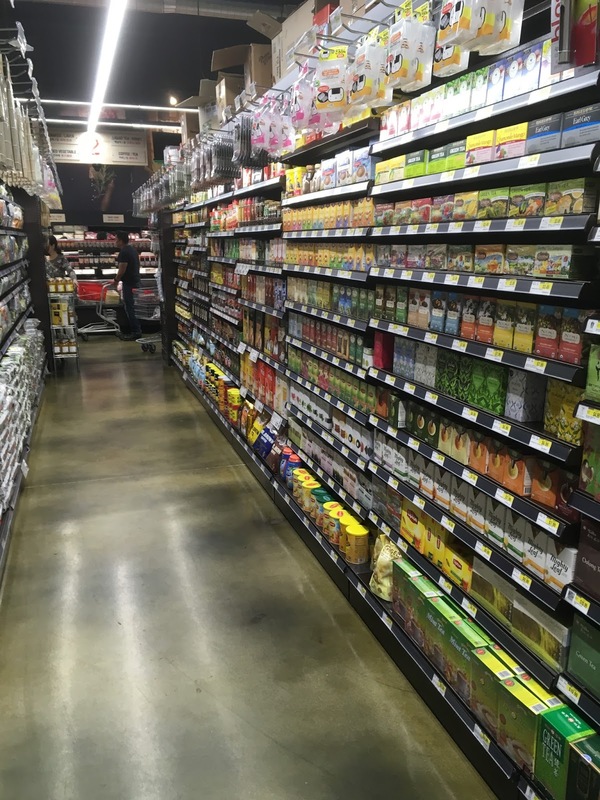 The frozen department is the most spacious in the store, with a heavy emphasis on Asian and organic products. Next to the restrooms is Tous Les Jours, an upscale coffee shop/bakery, which also has a small counter for seating. The products here look amazing, but again, are quite expensive. The displays are top-notch. Looking along the front-end. Although the store was very crowded, all the registers were open and there were almost no lines. The large digital screens play videos about cooking, food, and Hmart's stores. Good for people who are here for the first time, and entertaining I guess if you're waiting in line for a long time. 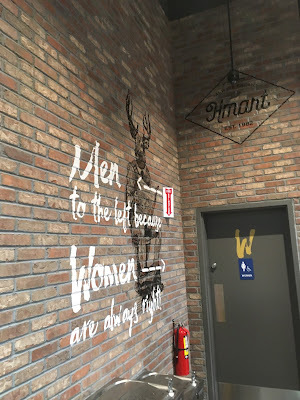 Do you have any Hmarts where you are, or have you ever been to one? They're not all this impressive, but the new ones are amazing. None that I know of near me, but even if there are, I haven't been. If I ever see a new one though, I'll definitely keep this post and this location in mind! Very nice store. The carts seen in your picture are actually standard Technibilt models mainly used in drugstores like CVS, and smaller A&P locations. The Clinton location definitely had those! Ah, so I guess they just seemed a little out of place. Also, I don't think I've ever seen the double-decker basket thing in a supermarket before (although I know I have seen it in other places). It should be noted this was previously a Staples. 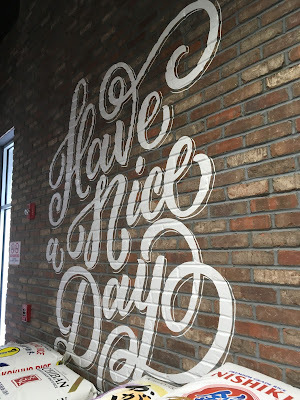 Only the exterior facade retains any vestige of them, and the fact that Staples stores have minimal decor made it quite easy for them, no doubt. Yes, thanks -- I forgot to mention that. You're right, Staples' decor must have been easy to remove and fit with the new decor.